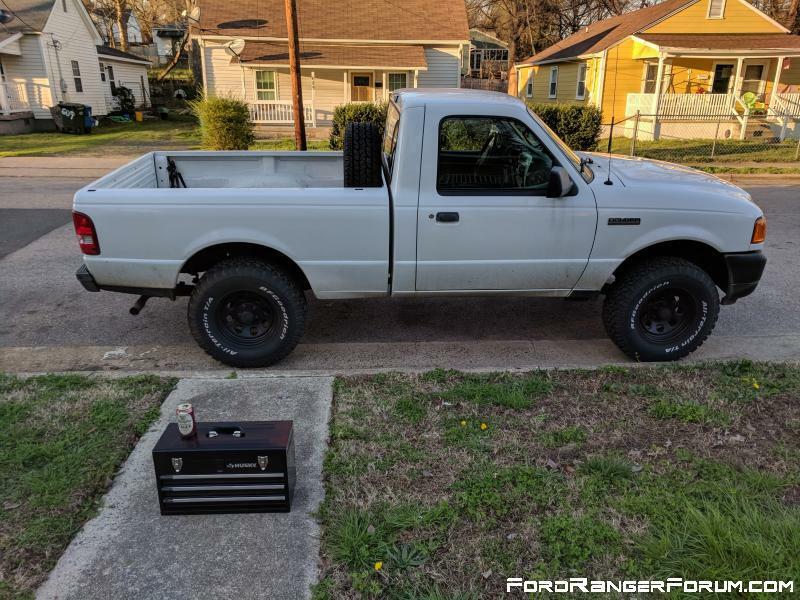 After putting bigger tires on my truck I felt like the stock spare under the bed was pretty much useless. I picked up a spare 31" tire for cheap on craigslist, popped it on one of my old rims, and decided to mount it in my bed. I've been wanting to do this for a while and had a few ideas bouncing around in my head. I saw a few aftermarket products and thought they were too expensive. 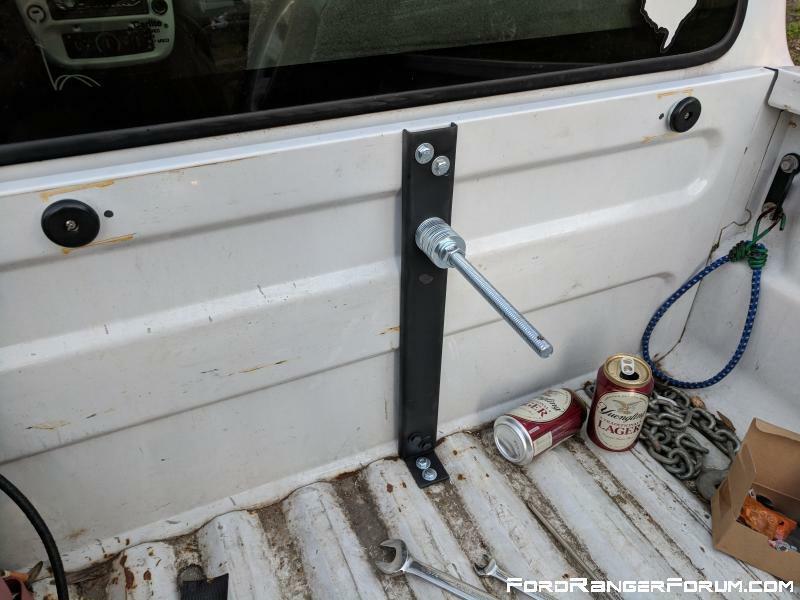 I've also seen a few homemade solutions people came up with, some involving welding, and some as simple as a bolt ran through a hole in the bed. I came up with what I figure is a pretty solid middle ground for those of us who don't want to break the bank, but also want something a little more robust. I didn't take step-by-step photos as I was doing this since there was a lot of trial and error and beer involved, but I'll post a bunch of pictures of it installed and try my best to describe what I did. I won't give a comprehensive list of materials as this "design" is pretty flexible. I used a lot of things I had laying around. So the reason I decided on the C channel was twofold. 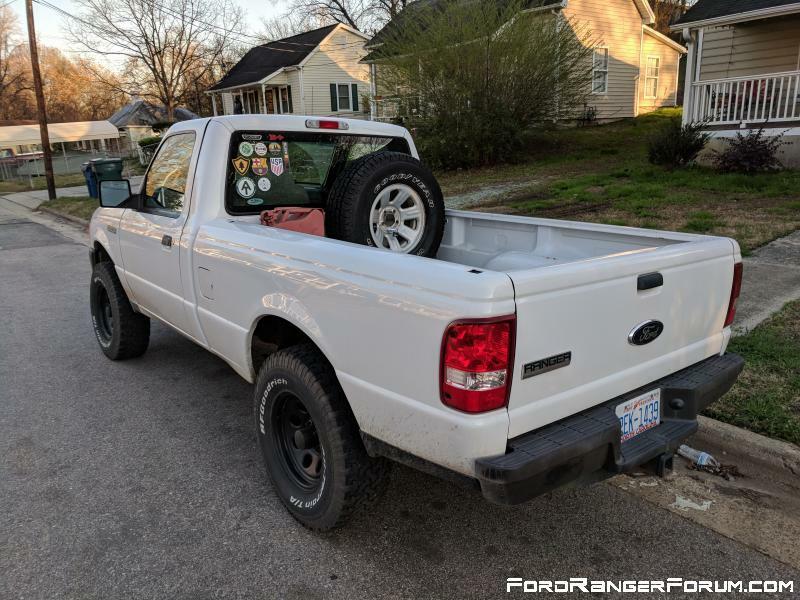 It's much more rigid than flat bar steel, and it gives you space in the back to hide the big bolt head that you're going to use to secure your tire to it. 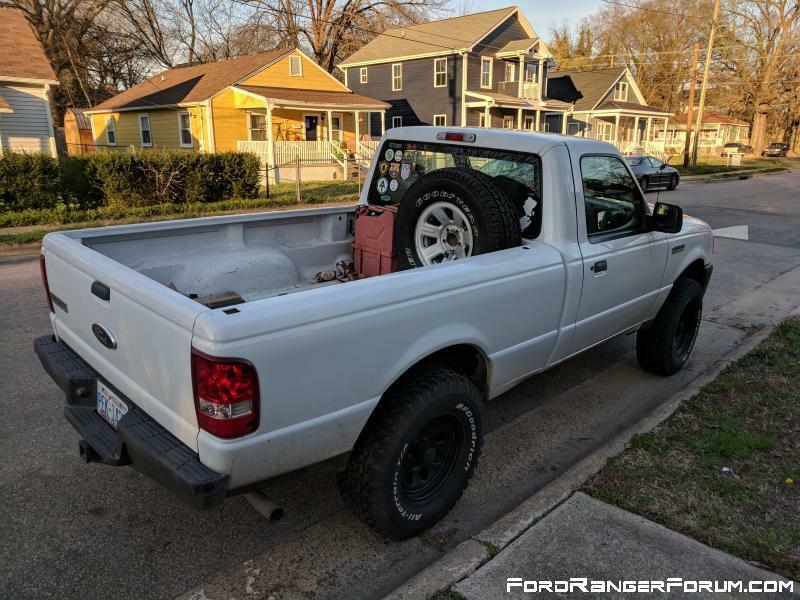 Essentially what you're doing is making a bracket that you can bolt to your bed in multiple places for added rigidity, then mounting your tire to that. Start by cutting off a piece of angle iron to fit inside the C channel and used it as a mounting bracket. Clamp the bracket and the C channel together and drill two holes through both pieces. Bolt them together, then cut off the excess threads on the back side. Drill four more holes, two in the bottom of the angle bracket, and two in the top of the C channel. Position the assembly in your bed and mark through the holes. Drill holes in your bed. 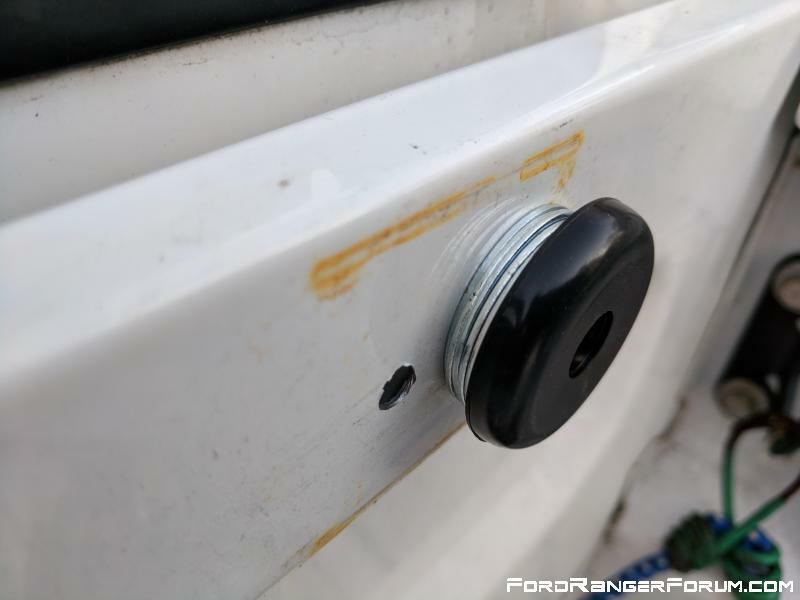 Before mounting, you're going to have to mock everything up to figure out where to drill the hole for the 1/2" bolt that's going to secure your tire. I eyeballed it and got lucky, but I would suggest measuring everything so you don't have to unbolt everything to make adjustments, because the installation is the hardest and most annoying part of this project. At this point you should paint the bracket. The raw steel will rust very quickly. I just hit it with some flat black automotive paint I found laying around. Make sure to wash all the oil and grease off first and dry it thoroughly before painting. Now that you have everything marked up, drill a hole for the 1/2" bolt. While you're at it, drill a small hole through the end of the bolt so you can pass your small padlock through (this is optional). Once this is done, pass the bolt through the back of the bracket with a washer. You'll notice that I have about 247 washers on the front side of the bolt. This is because the bolt I had wasn't threaded all the way to the head and I wanted a way to secure the bolt to the bracket. So I threw a ton of washers over the unthreaded portion of the bolt then cranked down with a nut to secure everything. 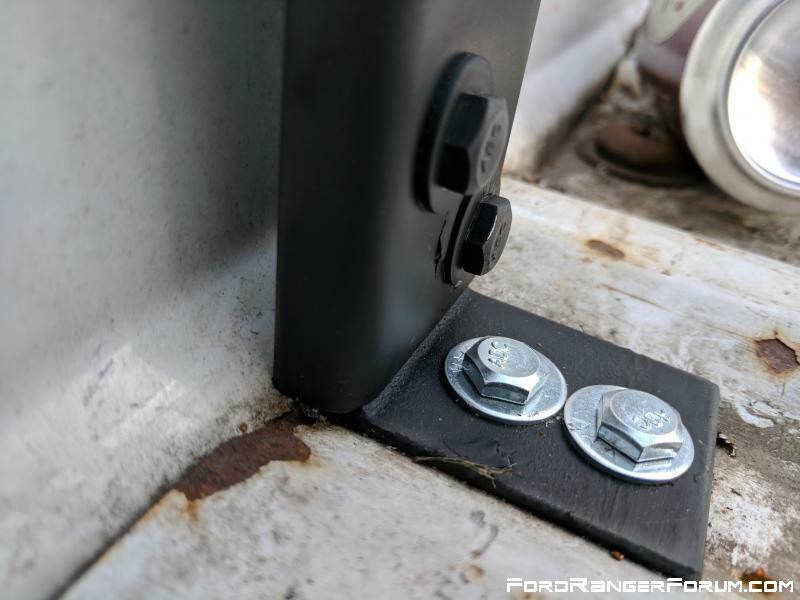 Your situation may be different depending on what type of fasteners you happen to use, so just be creative. The object is to have everything secure to minimize bouncing and wiggling while driving. Once the 1/2" bolt is secured, do one more test fit. Slide your wheel on and make sure everything lines up. Then go ahead and bolt the bracket into your bed. This is where things get tricky. I threaded on some washers to fill in the gap between the front of the C channel and the bed. I guess you don't have to, but I felt there was less chance of anything flexing or bending over time. For the bottom, you should definitely put something under there. I just stacked a few washers, since the bracket didn't fit all the way down inside the "valley" in my truck bed. I suppose you could also cut your angle iron down some to fit, or just mount it on one of the "peaks", but I liked the idea of the center of the tire sitting in that "valley". Anyway, thread your bolts through, then add a flat washer, lock washer and nut to each and tighten down. The bolts between the bed and cab are the most difficult. I have stubby fingers and I managed to do it, so just have patience and make sure you have extra hardware* because you will drop a few pieces. You can fit a wrench back there too to help tighten everything down. As for the bolts in the bottom of the bed, have someone hold a wrench on the bolt from inside the bed while you climb underneath, or just do what I did and wedge a wrench on there so it hits the front of the bed as you turn the nut from underneath. However you do it, make sure everything is snug. Once the bracket is mounted, put your tire on again. 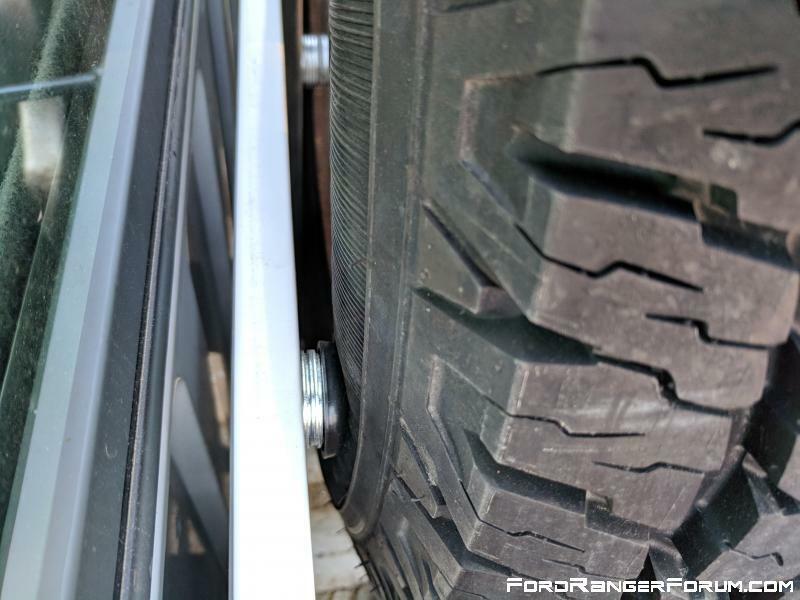 You'll notice that due to the thickness of the bracket, the tire is going to want to lean forward slightly and rock from side to side a little. So mark the location where the sidewalls contact the front of your bed. Remove the tire and drill a hole at each location and mount your rubber furniture bumpers. I also placed a few washers behind the bumpers to bring them out to the same thickness as the bracket. As you can see from the rust and extra holes, the rubber bumpers were a revision of my original idea, which was to just bolt a scrap piece of C channel to the bed. I had forgotten to paint those and they started rusting within a day. Plus I didn't like the idea of the tire pressing up against two exposed bolt heads. 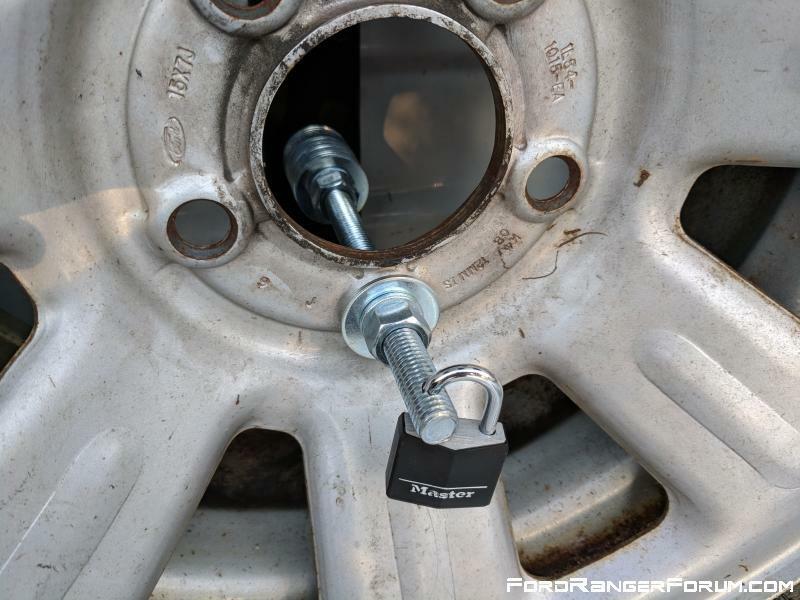 Now that everything is in place, go ahead and mount your tire on your new bracket and secure with a flat washer, lock washer and nut. Slap your padlock on and you're good to go. Don't overtighten the nut as you will bend your new bracket. Just tighten it enough to compress the lock washer and secure the tire enough so that it doesn't move. That's it! Total cost was around $20 for the furniture bumpers, a few odd nuts and bolts, and the C channel. Here are a few more photos of the tire mounted. 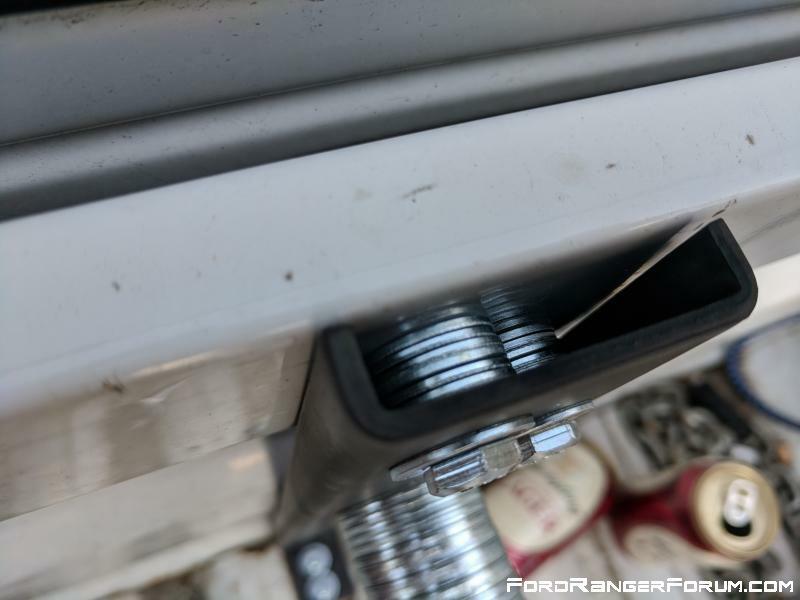 *A while ago, I bought bulk boxes of 1/4" hardware (1" and 1-1/2" bolts, nuts, flat washers, lock washers, fender washers) because I got tired of having to run out to the hardware store to buy one or two bolts, having to buy a bag of three, then losing the bag once I finished. I find I use them all the time now. Edit: I see the pics now woohoo!!!! Last edited by RoberticusMaximus; 03-01-2018 at 05:51 PM. Sorry, pics should show now. I had the album set to private. As I said in my original post, you can just bolt the wheel straight to your bed and call it a day, or just throw it in the back and let it bounce around. I wanted something that felt like it wasn't going to buckle the bed, and I like the way it looks. Plus I didn't see any guides on here for how to do it. If you have an idea you think is better, I'd love to hear it. Last edited by stickybuns; 03-01-2018 at 02:17 PM. I used straps. 4 eye bolts with nutserts, straps on an x shape across the tire. 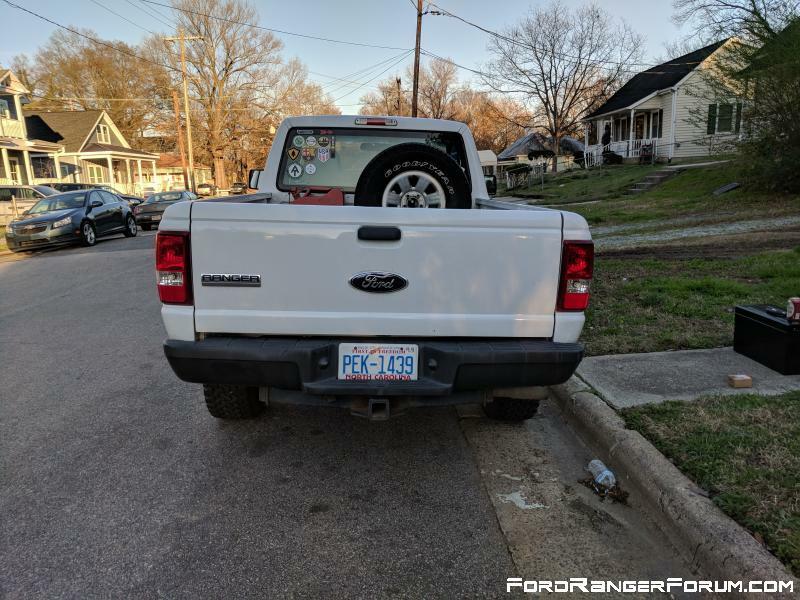 Worked fantastic, if I needed the space, email easily removable and I could unscrew the eye bolts and have a completely flat bed again in less than 5 minutes. But I mean if this works for ya, no harm in doing it that way. I like the idea of using straps, but I would worry about someone stealing it. I live in a city and anything not bolted down tends to walk off.